We carry the complete range of slate bed pool tables by Sam Leisure. Recognised by official tournaments and designed and built by craftsmen in the UK with free home delivery. SAM Leisure pool tables are some of the highest quality luxury pool tables available on the market today, and SAM also make air hockey and associated equipment to the same high standard. Their American pool tables and English pool tables grace some of the world's finest bars, nightclubs, pool halls and homes, boasting style with reliability and durability as well as commercial profitability. Sam Leisure pool tables are some of the finest tables you will find anywhere in the world. They are high-end luxury pool tables, designed for clients who want the very best in modern pool table design and play. The Sam Leisure Atlantic, voted best Pool Table at the latest Coin Slot awards ceremony, is now used in all the BAPTO pool tournaments and will be for the next five years. These include the World 8 Ball Championships, the English Counties Finals, BAPTO Grand Finals, European 8 Ball Championships and the Welsh Festival of Pool. The Sam K-Steel American Pool Table is and has been for many years the best selling American Pool Table in both the UK and Europe. 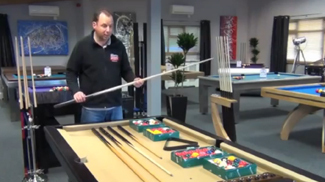 Last year every ranking Professional American Pool tournament was played on Sam K-Steels. Our SAM pool tables all come complete with free delivery and free accessories, so you have all you need to get started once you receive your table. These accessories include two cues, a set of balls, a triangle and chalk, so with no extra cost you'll be enjoying a game of pool on a fantastic new table. Whatever you are looking for, we should have you covered. If not, just give us a call on 0800 622 6464 and one of our friendly expert advisors will be able to help you. Our range of SAM pool tables is available with a huge choice of finishes, sizes and cloth colours. All SAM tables are made to SAM's exacting standards, meaning a SAM table is a fantastic and reliable purchase, offering you a great game of pool on a table that will last for many years to come. To give you that extra layer of reassurance, SAM tables come with an incredible 12 month warranty against manufacturing defects. All SAM tables are fully customisable and come in a great range of finishes and cloth colours. If you can't find exactly the cloth colour you want in their standard range, we can supply Smart Cloth by Hainsworth, or one of our huge range of logo cloths, which include football club logos, Jack Daniel's or any printing of your own design. If you need any help choosing your perfect table, or deciding on colour schemes and finishes, please give one of our expert advisors a call and we'll be happy to talk through all your options. If you are looking for some expert advice, either on SAM Pool Tables or on any of our other products, please just give our friendly team of advisors a call on either our freephone number 0800 622 6464, or on our main line number 01454 413636.